This event is non-contact, Blocking and Tackling are not allowed. Ø Paper, rock, scissors determines first possession. The winner has possession of the football first. Ø There are no kickoffs. Ø The offensive team takes possession of the ball at its 5-yard line and has four (4) plays to cross midfield. Once a team crosses midfield, it has four (4) plays to score a touchdown. If the offense fails to score, the ball changes possession and the new offensive team takes over on its 5-yard line. An automatic first down by penalty will overrule the other requirements regarding four (4) plays to make either a first down or score. Ø If the offensive team fails to cross midfield, possession of the ball changes and the opposition starts its drive from its 5-yard line. Ø All possession changes, except interceptions, start on the offense's 5-yard line. Ø Teams consist of up to 10 players (5 on the field with 5 substitutes). It is suggested that teams have 8 players on their roster. Ø Teams may play with a minimum of four (4) players (due to injuries). Ø If less than 4 players are available, the game is forfeited by the side that is unable to field a team. Ø Each time the ball is spotted the offense has 30 seconds to snap the ball. Ø Note: An Interception return to the opponent’s end zone on any extra point play by the defense will result in the defense scoring 2 points plus possession for next series at its 5-yard line. Ø To start the play, the ball must be snapped between the legs of the snapper. Ø The center is the player who gives the ball to the quarterback via a snap. The center cannot take a direct hand off back from the quarterback (no center sneak play). 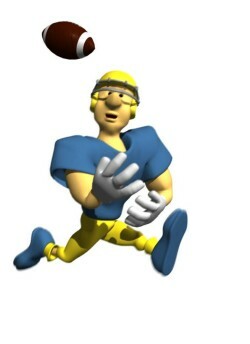 Ø The quarterback is the player who receives the ball directly from the snap. Ø The quarterback cannot run with the ball past the line of scrimmage, unless he has handed the ball off, tossed or pitched, and it has been returned to him. Ø An Offense may use multiple handoffs behind the line of scrimmage. Ø Tosses or sweeps behind the line of scrimmage are allowed and are running plays. Ø Once the ball carrier has crossed the line of scrimmage the ball cannot be handed off, tossed, pitched or passed in any way. Ø "No-running zones," are located 5 yards in front of each end zone. When the ball is on or inside the 5-yard line going towards the opponent’s end zone, the offense cannot run. Ø The player who takes the handoff, toss or pitch can throw the ball from behind the line of scrimmage. Ø All defensive players are eligible to rush once the ball has been handed off or tossed, or there is a play action fake or fake handoff. Ø Spinning is not allowed and the ball carrier cannot dive forward or jump to avoid a defensive player or gain yardage (no diving). Ø The ball is spotted where the ball carrier's feet are placed when the flag is pulled, not where the ball is. Ø All players are eligible to receive passes (including the quarterback if the ball has been handed off or tossed behind the line of scrimmage). Ø As in the NFL, one player may be in motion, but not in motion towards the opponent‘s end zone at the snap. Ø A player must have at least one foot inbounds when making a reception. Ø Only players starting 7 yards from the line of scrimmage can rush the passer. Ø Only one forward pass thrown from behind the line of scrimmage is allowed in a down. Ø Interceptions change the possession of the ball. Ø Interceptions can be returned by the defense. Ø On interceptions that occur and remain in the end zone, the ball will become dead and will result in the ball belonging to the intercepting team at its 5-yard line. Should an interception occur in the end zone and the ball carrier leave the end zone, the ball will belong to the intercepting team at the spot where the ball is ruled dead. However should the ball carrier return to the end zone and be deflagged or the ball be ruled dead the result would be a safety for the other team. Ø Substitutions may be made only when ball is dead. · An official blows his whistle. · Ball carrier's flag is pulled or becomes illegal. · When any part of the ball carrier’s body, other than his hand or foot touches the ground. Ø If a ball carrier's flag falls off, the play will be whistled dead and the ball will be spotted at the spot where the flag fell off. Ø If a player receives the ball by pass, hand off, toss or pitch, after a flag has fallen off, the play is ruled dead at the point he gains possession of the football. All players who rush the passer must be a minimum of seven yards from the line of scrimmage when the ball is snapped. Any number of players can rush the quarterback. Players not rushing the quarterback may defend on the line of scrimmage. Once the ball is handed off or tossed, or there is a play action fake or fake handoff, the seven-yard rule no longer is in effect and all defenders may go behind the line of scrimmage. A special marker, or a game official, will designate seven yards from the line of scrimmage. REMEMBER, blocking AND tackling ARE not allowed. If the referee witnesses any acts of flagrant contact, tackling, elbowing, cheap shots, blocking, or any unsportsmanlike act, the game will be stopped and the player will be ejected from the tournament. FOUL PLAY WILL NOT BE TOLERATED! Trash talking is illegal. (Trash talk is talk that may be offensive to officials, opposing players, teams, or spectators.) Officials have the right to determine offensive language. If trash talking occurs, the referee will give one warning. If it continues, the player or players will be ejected from the game. Ø All penalties are 5 yards. The down will be repeated unless otherwise noted, and will be assessed from the line of scrimmage. Ø All penalties may be declined, except a false start (dead ball foul). Ø Penalties will not exceed half the distance to the opposing team's goal line from the line of scrimmage. Ø Only the team captain and Head Coach may ask the referee questions about rule clarification and interpretations. Players and Coaches cannot question judgment calls. Ø Penalties after an interception shall be assessed after the return is over and/or the play is blown dead. Ø Offside — 5 yards. Ø Substitution fouls — 5 yards. (player enters field after the ball is “in play” by the referee. Ø Disconcerting signals — 5 yards (signals to distract / simulate offensive signals prior to snap ). Ø Interference with opponent or ball at the snap — 5 yards. Ø Illegal rushing — 5 yards (starting rush from inside 7-yard marker). Ø Interference —5 yards and automatic first down. Ø Illegal contact — 5 yards and automatic first down (holding, blocking, etc). Ø Illegal flag pull — 5 yards and automatic first down (before receiver has ball). Ø Flag guarding — 5 yards. Ø Delay of game — 5 yards. Ø Substitution fouls — 5 yards. Ø False start — 5 yards (cannot be declined). Ø Illegal snap — 5 yards. Ø Illegal shift or failure to pause for 1 second — 5 yards. Ø Offensive holding — 5 yards. Ø Running inside a no running zone is a loss of down at the previous spot. Ø No padding or headwear shall be allowed. Ø Cleats are allowed, but must be rubber. Inspections must be made. Ø Official tournament jerseys must be worn during play and tightly tucked into their shorts or pants. Teams without jerseys will be provided colored vests. End Zones: Maximum 10 yards deep, minimum 7 yards deep. No Running Zones: These must be marked 5 yards from each goal line.